Guest post by Karen Chapman and Christina Salwitz, the Seattle-based authors of Fine Foliage. When the last leaf has fallen, what do you have left in your garden? Are there winter highlights that you look forward to or do you turn a gardeners blind eye until you can welcome spring? This scene shows that you can celebrate the quiet season and learn to appreciate the stark beauty of a landscape. Where does your eye go first? 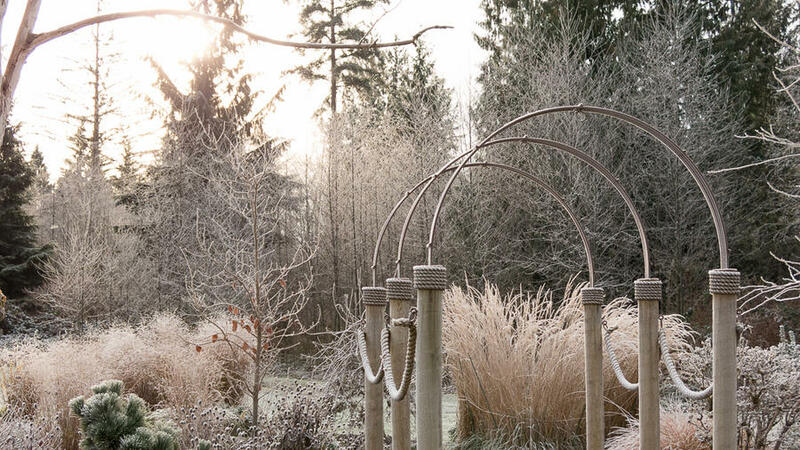 I am drawn to the arbor which we designed using a mix of wood, rope and metal. It needed to be of a large scale yet also be transparent as we weren’t trying to design a tunnel! Looking at the wintery scene I find myself peering through the arbor to the stand of tall Karl Foerster feather reed grasses, frozen in place yet standing out prominently from the skeletal trees in the distance. To the left of the arbor is a green teddy bear. Well it is really a Japanese black pine that reminds me of a teddy bear because it is so fluffy! It has a visual strength, a solidity that is needed in an otherwise delicate vignette. Finally the sweep of icy Shenandoah switch grass behind the pine gets my attention; a finely textured haze that highlights the pine perfectly. So in a bare bones landscape it is still the foliage that helps define spaces, creates a backdrop or becomes a picture frame. Even when frozen, Foliage is Fine.